Edward A. 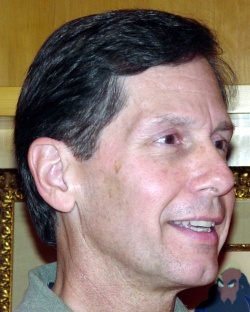 "Ed" Oates (born 1946) co-founded Software Development Labs in August 1977 with Larry Ellison, and Bob Miner. Software Development Labs later became Oracle Corporation. Ed Oates graduated with a BA in mathematics from San Jose State University in 1968, and worked at Singer, the US Army Personnel Information Systems Command (PERSINSCOM) (drafted), Ampex, and Memorex before co-founding Oracle. He retired from the company in 1996. He volunteers time on the Board of Directors of the San Francisco Zoological Society and the Tower Foundation Board of San Jose State University. Mr. Oates recently became one of the limited partners of Rock and Roll Fantasy Camp and has participated in several rock camps. In his spare time Ed skis, builds H0 scale model railroads and does video work for the Woodside Priory School Theater. He also plays in the band Choc'd. 1998年9月，ORACLE公司正式发布ORACLE 8i。"i"代表Internet，这一版本中添加了大量为支持Internet而设计的特性。这一版本为数据库用户提供了全方位的Java支持。ORACLE 8i成为第一个完全整合了本地Java运行时环境的数据库，用Java就可以编写ORACLE的存储过程。对，Java，只要是能够打击微软的武器，ORACLE都要派上用场。ORACLE8i 添加了SQLJ（一种开放式标准，用于将SQL数据库语句嵌入客户机或服务器Java代码）和ORACLE interMedia（用于管理多媒体内容）以及XML等特性。同时，ORACLE 8i 极大程度上提高了伸缩性、扩展性和可用性以满足网络应用需要。接下来的几年中，ORACLE陆续发布了8i的几个版本，并逐渐添加了一些面向网络应用的新特性。面对开源运动的蓬勃发展，ORACLE自然不甘落后，1998年十月ORACLE发布了可用于Linux平台的ORACLE 8 以及ORACLE Application Server 4.0，随后不久，ORACLE又发布了ORACLE 8i for Linux。在 .com大潮中，ORACLE是站在风口浪尖的弄潮儿. Processed in 0.091641 second(s), 11 queries.